Social media is ever-changing and can be insanely difficult to keep up with, especially if you’re managing multiple accounts for your business. When should you post? What should you post? How do you find content? There are countless questions. Luckily, there are many tools that can help strengthen your social media content strategy. While all social media needs are different, we at Square 205 have come up with a list of our 6 favorite social media tools. These tools aren’t just the ones we like; they are the tools we use often, if not daily. Let me start off by saying we use the free versions of all social media tools. I say this not so you think we are cheap, but to show that you don’t have to spend an arm and a leg to get the most out of your social media marketing. This is probably my favorite social media tool, as well as one I feel is essential for our content strategy. A content calendar is a place for you to keep track of when you will post specific content on each of your social media channels. This tool is different than the other ones I will be talking about in this post because there are countless ways you can have a content calendar. At Square 205 we use a Google Calendar, this way we can easily share it with everyone in the office. Personally, I also keep a color-coded planner, so I also have the contents of our content calendar written in blue in my planner. So, why is having a content calendar so important? First of all, it helps keep your content strategy organized and helps with time management. If you know you are going to need a graphic made for a social post coming up, it gives you the chance to talk with your designers and get it made without overwhelming them with “I need this made in 1 hour.” Or, if you post about a variety of topics, organizing everything in your content calendar helps ensure you aren’t posting too much about one topic and neglecting all others. Another helpful thing about content calendars is that you don’t miss important dates. Let’s say your company’s anniversary is coming up, you obviously want to make a social post! Planning it out by putting it on your content calendar helps you not have an “oh crap that’s today” moment. Social media management platforms are commonly used amongst people who manage social media for businesses. Hootsuite is a very popular one, and it is what we use here at Square 205. Basically, Hootsuite allows you to manage all of your social media accounts on one screen. Scheduling posts, responding to comments, and viewing feeds are just a few of the many things you can do while using Hootsuite. My favorite feature is that you can make streams. For example, if there are people or companies you want to ensure you engage with on Twitter, you can create a stream for those specific accounts. This makes it easier to see only the Tweets posted by these accounts, without having to actually visit their Twitter pages. As I mentioned before there are many platforms that help with managing social media accounts. So, why do we use Hootsuite? Hootsuite is one of the oldest and most widely known social media management tools, so naturally, it works well with most online platforms. They also have an awesome support platform and great training tools. We also enjoy the fact that Hootsuite’s dashboard makes it easy to see everything in one place. For example, all of our Twitter streams are on one page. We don’t have to change tabs constantly to see what is going on. Hashtags are hard to keep up with at times, and it can be difficult to decide which hashtags make the most sense for your post. Rite Tag makes this process easier. All you have to do is search the term or subject your post is about, and Rite Tag will show you what hashtags are hot currently, which ones are useless, and which ones will get you a good amount of traction over time. This tool is extremely important for Twitter; With only 140 characters, you have to choose your hashtags carefully. After stumbling upon Rite Tag when I was an intern, I have used it for almost every hashtag I use on Square 205’s social media. I’ve only recently started using Pocket, but I’m already obsessed. Pocket makes it easy to save articles, blogs, and more that you want to read or come back to in the future. Social media for your business should be partially promoting your services, but it should also involve sharing related news, blogs, and more. Before using Pocket, I would have 20 tabs open so that I wouldn’t lose articles I wanted to read over and possibly share on our Twitter account. Now, I just click a button on my browser (I use the Google Chrome extension). Another cool thing about Pocket is that you can add tags to the pages you save. When posting content to social media, you want to ensure you’re mixing the topics up a bit. For example, at Square 205 we post about digital marketing, design, eCommerce, and more. If I notice I’ve been posting more about digital marketing than these other topics, it’s easy for me to search through my Pocket account for content with other tags. Before Twitter created their own link shortener, they used Bit.ly to automatically shorten links in Tweets. Most of us have used Bit.ly to shorten links on our own, but, did you know there is more to Bit.ly than just link shortening? If you have an account (which is free for the basics!) you can receive insights on the links you post. For example, if you post a link on different social media channels, Bit.ly can tell you how many clicks the link received, and how many clicks came from each specific channel. These analytics are helpful because they can show you what platforms you get the most traffic from, and you can look for trends between platforms and topics of content posted. If This, Then That (or, IFTTT) is a tool I have used for things such as getting emails when it is going to rain, and having my Philips Hue turn on when I arrive home (and turn blue when it rains). Among the countless “recipes” you can use (or even create), there are a TON that are for social media. Are you ever annoyed that when you share an image to Twitter from Instagram, it shows up as a link and not a photo? 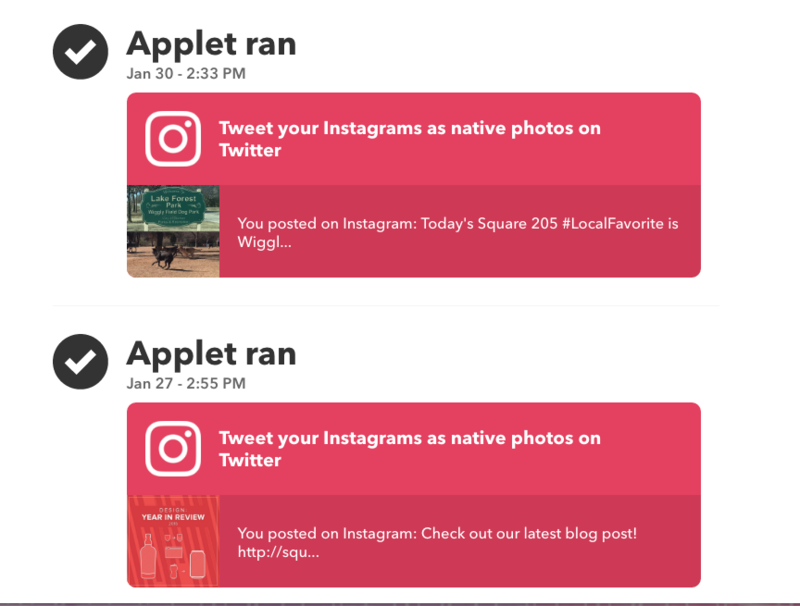 IFTTT has a “recipe” that will post your Instagram images as native images to Twitter. Do you want your business’ social media profile pictures to be the same across the board? You can set IFTTT up to change the images on all platforms every time you change it on one profile. It’s so hard to describe the benefits of IFTTT because it’s impossible to know everything it can do for your business on social media. Basically, if you want it to happen, search it on IFTTT, because it’s very likely someone has created a recipe (and if not, you might be able to create it). Let’s Put These Tools to Use! Now that you know about all of these tools, you have the ability to create successful social media campaigns with minimal stress! However, we also understand that even with all of these tools, social media can be hard to tackle. Hopefully, at least one of these tools discussed can make your life easier. If you’re still finding yourself stressed out and frustrated, contact us! Our marketing team can help your business get on the right track. Oh, and don’t forget to follow us on social media. Our Facebook, Twitter, Instagram, and LinkedIn are updated constantly, so check us out!